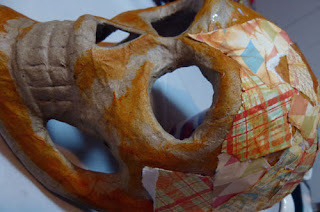 It's a spooky good morning today and Steph here with project that was truly fun to create. I found this paper mache skull in my local craft store and picked it up. I had no plan in mind, but thought it would be fun to work on at some point. Picking it up one afternoon, I decided to see how I could transform it. 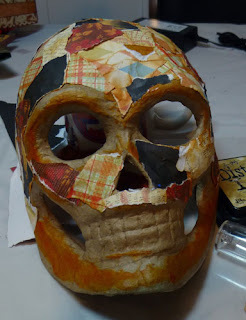 I first covered the skull with Ranger Distress Stains and Ranger Rusty Hinge Distress Ink. I tore scrap paper into small pieces and folded them into smaller pieces, then sponged some Ranger Old Paper and Rusty Hinge across each piece. Using The Best Glue Ever by Scraperfect, I coated an area of the skull, smoothed the glue across the skull and then proceeded to add the paper pieces. As I finished one area, I added glue to the next area and continued until the skull was completely covered with pieces of paper. I continued adding pieces until I was happy with the look. Then I added some additional Ranger Rusty Hinge Distress Ink around the outside of the skull to finish the areas that did not have paper. Next, I lightly added some Piccolo Adhesive around the skull. I didn't want to cover the entire skull, I just wanted to add some Enamel Powders randomly across the skull. Along the top of the skull I used Temple Stone. Around the eye sockets, I used Gilded Rose and around the mouth I used Girl's Night Out. 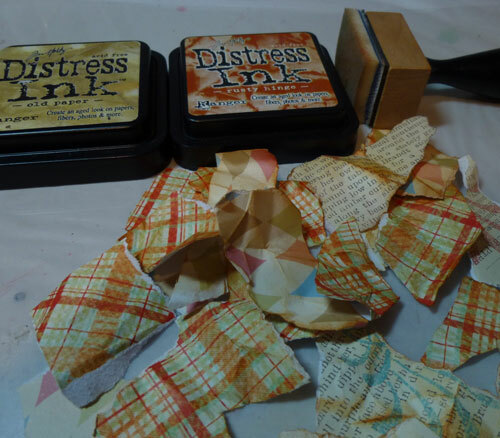 After adding the powders, I heat set the areas, and added more powders as necesssary to fill in the areas I wanted. 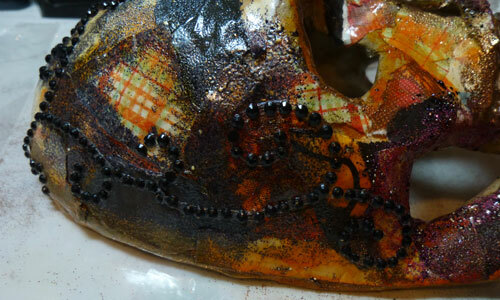 After the skull cooled, I added a thin layer of Glastique around the skull. 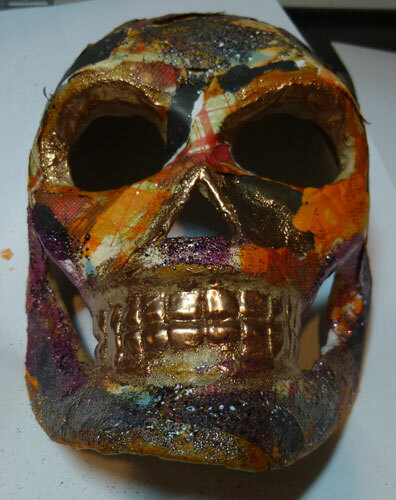 I wanted to create a shiny appearance as well as create a protective layer for the skull. 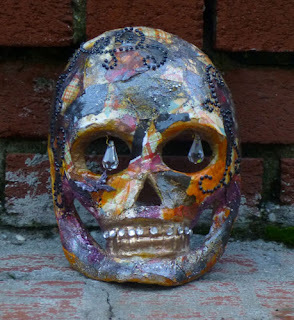 I allowed it to dry overnight, then thought it needed some bling. 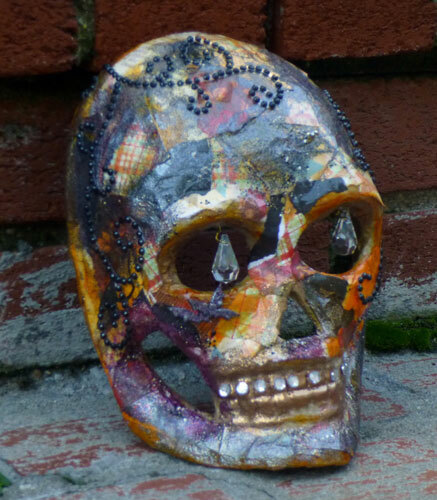 I selected some Want2Scrap clear rhinestones for the teeth and several black rhinestone swirls for either side of the skull to complete it's tranformation. I coated some bats from the Haunted Accents collection with Enchanted Aubergine and applied a light layer of Glastique once they cooled. 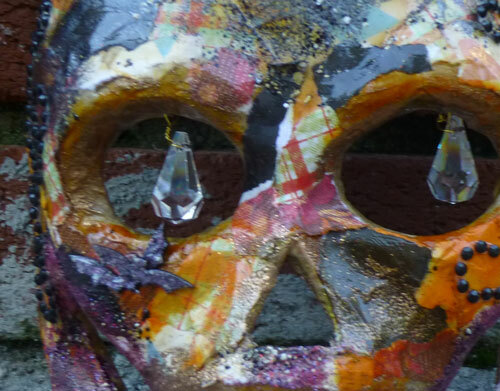 Then I thought I'd add some beautiful Connie Crystals in the eye sockets. 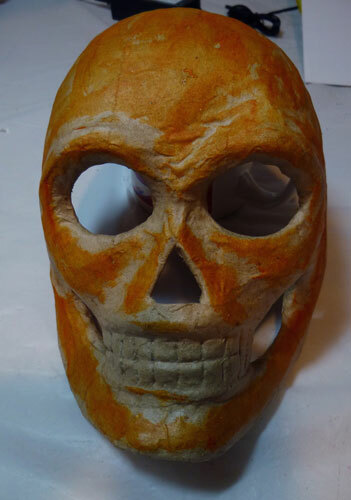 Now the skull's transformation is truly complete. 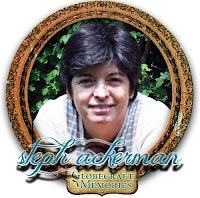 This is very, very cool Steph! I love those teeth!